First, a little backstory behind this recipe for Best Ever Potato Salad. My husband and I were married in 1997. The following year we moved to England. My husband was in the Navy and that was to be our new duty station. I was only 22 years old at the time and I was ecstatic about living in another country but I was also a little scared about moving so far away from all of our friends and family. We were to be there for 3 years and that meant I was also going to have to find a job there and learn to drive on the wrong side left side of the road. We found a little bungalow in the London suburbs in a town called Northwood. It had a very tiny kitchen but it had enough room for a small table. I really wanted to be able to make some good meals in this new home of ours. Unfortunately, I didn’t know how to make a whole lot. I made a pretty good lasagna and that was about it. We didn’t have a home computer then so there wasn’t a website or blog I could go to for help. Instead, I had my Mom. Well, as close to my Mom as I could get. 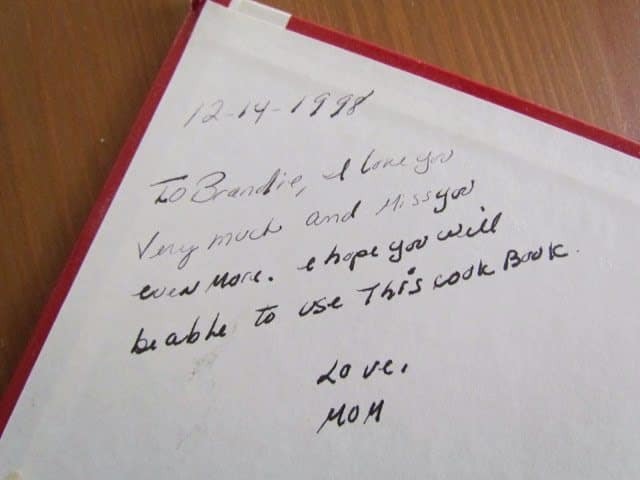 She sent me my first cookbook that first year we were there. Moms always know just the right thing to get you, don’t they? 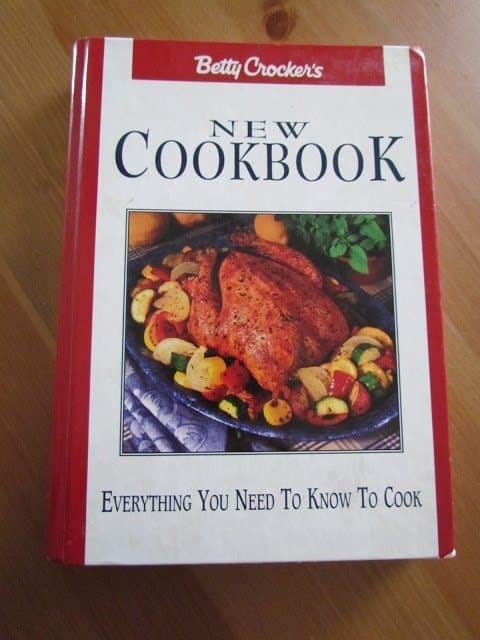 This cookbook really saved me. 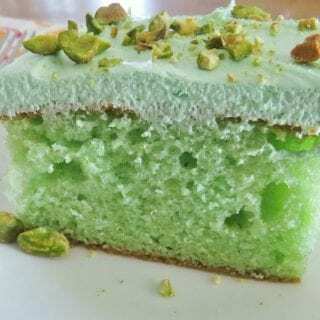 I got so many great recipes from it and I still go to it first when I am looking for something to make. Before I got this book, I had taken the most horrible fruit salad (which looked more like fruit soup) to a potluck that my husband’s boss was having at his house. What a first impression that was. I was so embarrassed! I was determined to redeem myself the next time around. I’ve only slightly modified this recipe over the years. And that’s just what I did. I had this book for about 2 weeks before another potluck rolled around. 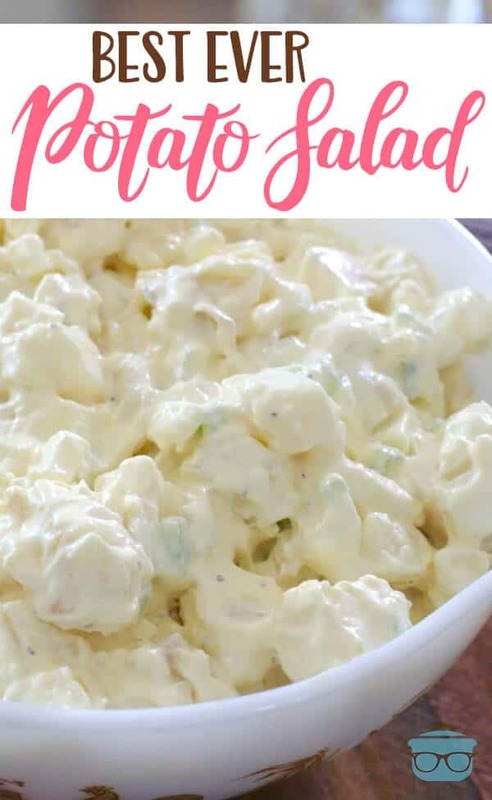 And this time, Chief Wilson, the hubby’s boss, offered to give me his cheesecake recipe if I would give him this potato salad recipe. No problem! And to this day, I still make his cheesecake and this potato salad. They are classics to me now. Peel and dice potatoes into cubes. Place potatoes into a large pot of water. Boil for about 20 minutes (or until fork tender). Take care not to overcook your potatoes – you don’t want them overly mushy. Mix mayonnaise, vinegar, mustard, chicken stock and salt and pepper in a large bowl. Add potatoes, celery, onion and stir gently. Stir in eggs. Cover and refrigerate at least 4 hours to blend flavors and chill. 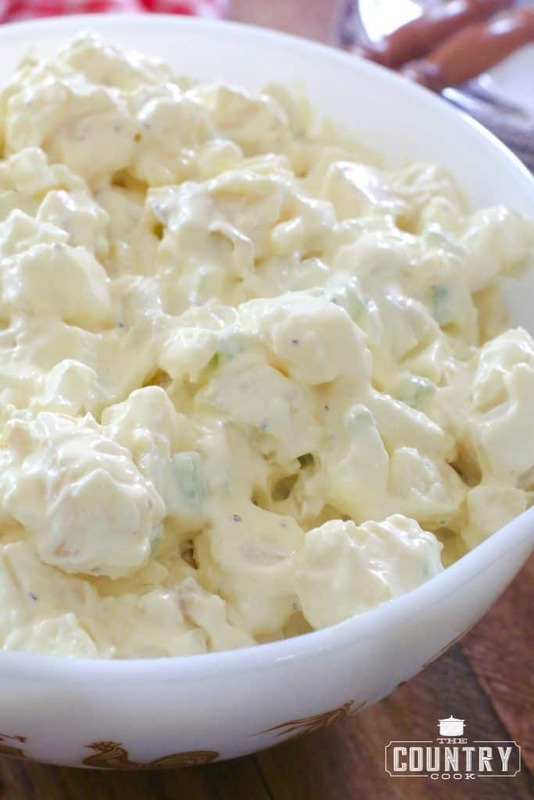 Cook’s Note: Potatoes love to soak up all the mayonnaise, so if you noticed your salad is just a little dry when you are ready to serve, add a little more milk or chicken stock and mayonnaise and it will restore the creaminess of your potato salad. How do you make the perfect hard boiled egg? Put eggs in a medium pot. Cover with cool water. Place on burner over high heat. Bring to a boil then take pot off of heat and cover with lid. Set timer for 15 minutes. Dump water out of pot and rinse with cool water. You will have perfectly hard boiled eggs and no green rings! 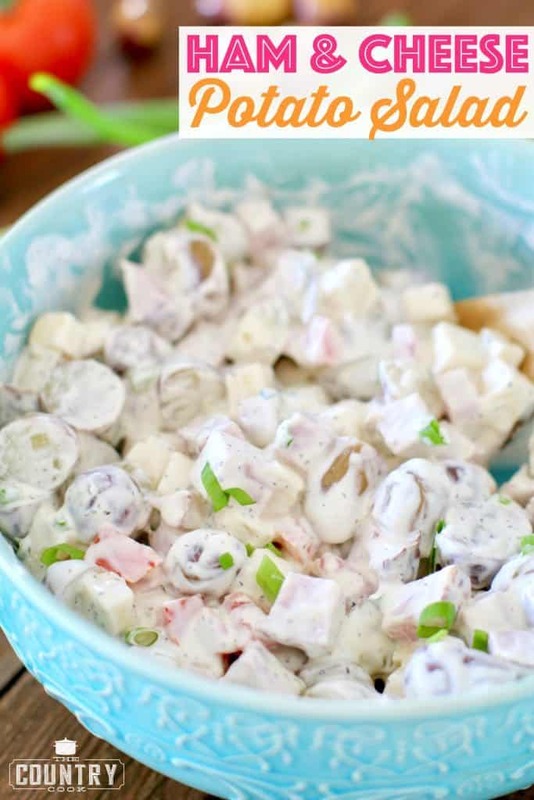 This is the BEST EVER potato salad and is always requested at every get together. 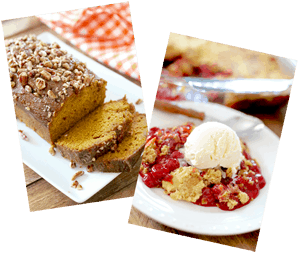 Folks always ask for the recipe because it is that good! Peel and dice potatoes into cubes. Place potatoes into a large pot of water. 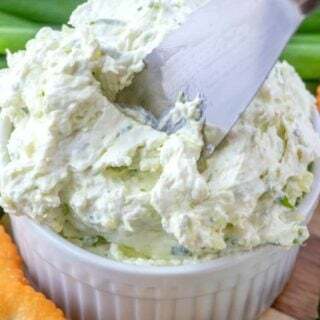 Potatoes love to soak up all the mayonnaise, so if you noticed your salad is just a little dry when you are ready to serve, just add a little more mayonnaise and chicken stock and it will restore the creaminess of your potato salad. 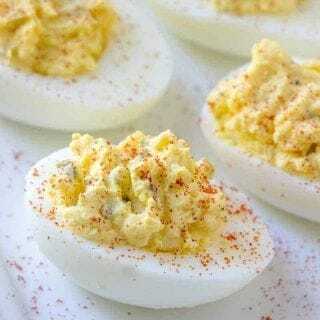 How do you make the perfect hard boiled egg? Put eggs in a medium pot. Cover with cool water. Place on burner over high heat. Bring to a boil then take pot off of heat and cover with lid. Set timer for 15 minutes. Dump water out of pot and rinse with cool water. You will have perfectly hard boiled eggs and no green rings! 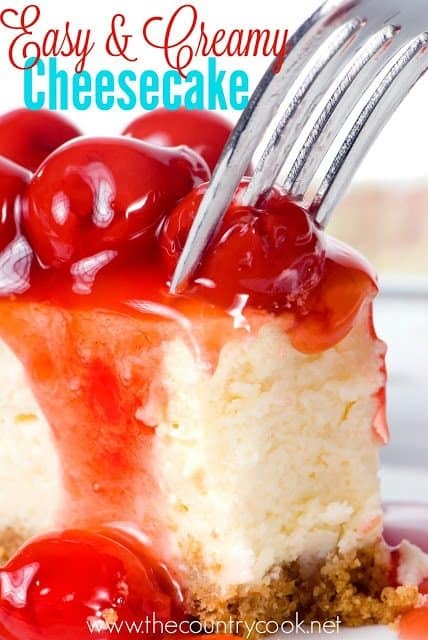 Here’s Chief Wilson’s Cheesecake recipe I mentioned above! 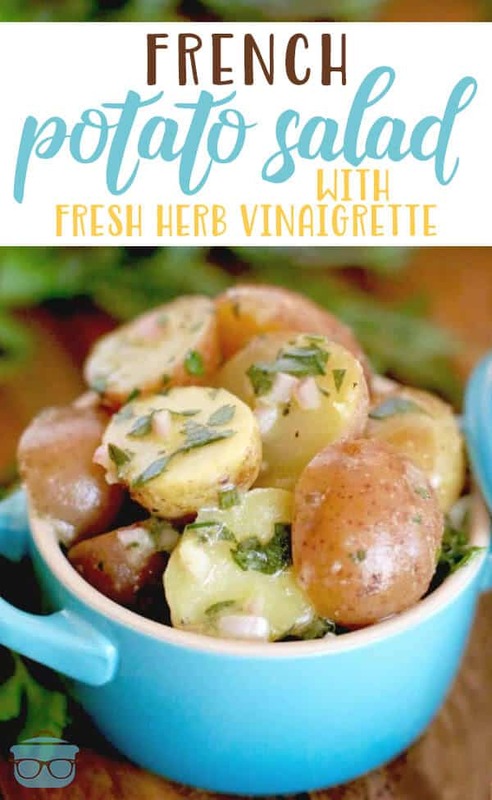 French Potato Salad – no mayo! Hi Brandie, I was just on pintrest looking at potato salads. My all time favorite is mayo, mustard, eggs, celery and onion. Never thot about chx broth. You know what i do use is dill pickle juice. Perfect replacement for vinegar, No? Try it next time. What do people do with all that juice anyway? lol Teri. I made this salad today because I was looking for a basic recipe since I didn't want to run to the store and knew I would have everything for something basic. This turned out great! And btw, that cookbook was my first cookbook too! I used that all the time when I first started cooking because it had so much info! If you're a first time cook that's definitely the book to get. 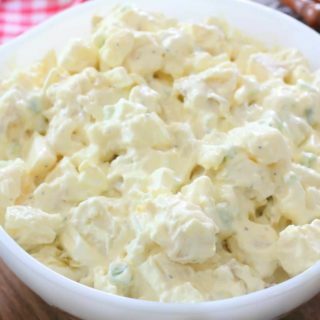 Yummy looking potato salad. When I spent a semester abroad while in college, our England base was in Northwood at London Bible College. Loved that little village! This was SO good! I came home with an empty bowl! It reached my expectations and my fiancé was like “Wow we did it! 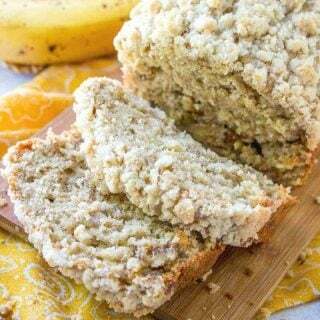 !” Can’t wait to try it once again..Thank you for this fab recipe ???? Wonderful! Love hearing that – thank you! I realize I’m a little late to the party. I have the exact same cookbook. We love so many recipes from this book. Especially the meatballs, meatloaf, pancakes, waffles – I can go on and on!!! Hello, I’m a black woman and I’ve never, ever heard of chicken broth in potato salad. It’s a must that I make this asap. Thank you for this one of a kind recipe. @ Ginny…I don’t think this recipe is a black/white recipe! ha! I’m white and I’ve never heard of chicken broth in potato salad, either…yes, I’m going to make it, too. 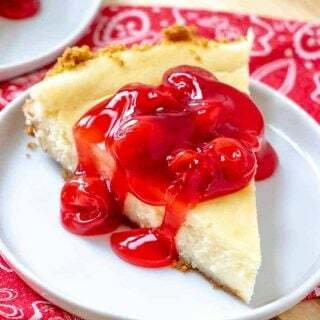 What was the cheesecake recipe !! Lol. Im wondering if the potatoes should be cooled before mixing in the rest of the ingredients. Agatha, they don’t need to be. You can let them cool slightly in the colander but they don’t have to be totally cooled. Hope that helps! I was hesitant about this recipe. 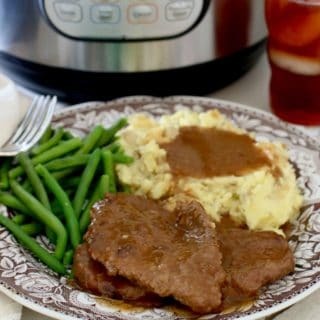 I loved the recipe where you had the potatoes soak in the mustard mixture. However, change is what life is all about so I went forward with it. I am soooooo glad I did. This is amazing. One of our new must haves in this house. Thank you. I don’t know if this is still active but I LOVE this potato salad and I keep getting compliments on it. I change it up a little, I add pickle juice and dill, minor things but I’m told by hubs and his family, “this is as good as grandma use to make.” Score! Except. Now I’m always asked to bring it. Haha. Looks great! Can’t wait to try it. So, where is the cheesecake recipe? Made it for my mom’s birthday. It was absolutely delicious!! Thanks for the recipe!! Brandy, I’m excited to try this recipe, but just wondering with the hard boiled eggs, do you take out the yolk and mix it with your mayonnaise, or what exactly do I do with that part? Thanks in advance for your advice. 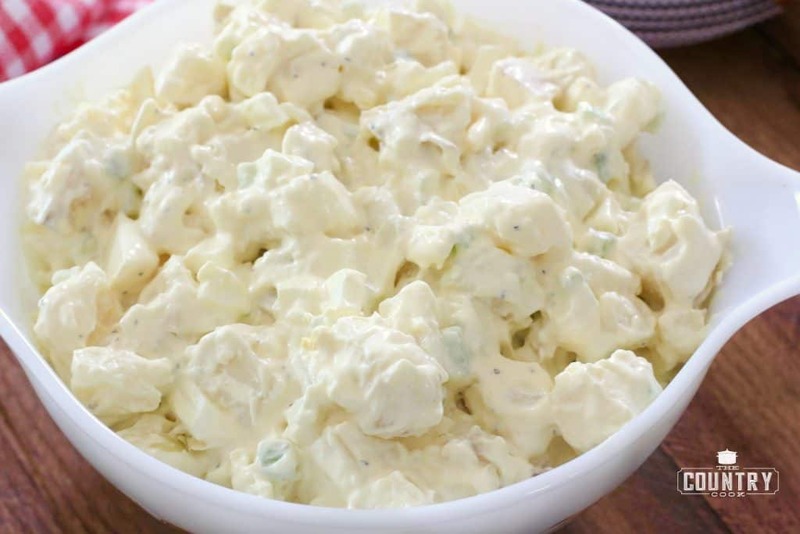 I made this potato salad yesterday, with only two differences: 1) I am not a fan of eggs, so they were omitted, and 2) I am a fan of dill relish in my potato salad so I added a couple of tablespoonsful. 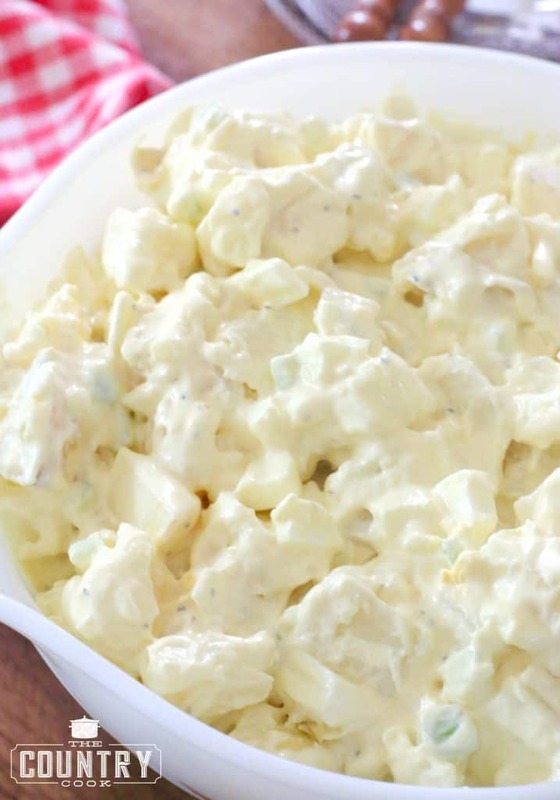 It really is the best ever potato salad! Thank you for reading it Tara!